Hot Rod TV did a show about a custom car shop that only does work on 1964 and older rides. The idea was that the old school philosophy was a fundamental part of the shop’s mantra and nothing newer had any place in their world. Hats off to these guys, they found a niche market of nostalgia wrapped in a vintage skin from Detroit massaged into something special by their skilled tradesmen. However a bundle of new school additions that made the ’64 Goat an old look ride in appearance only, with little actual relationship to old school period mods from 1964. There is actually nothing wrong with this resto-mod approach that gives 21st Century power and performance to an almost 50-year-old car. In fact this marriage of old and new has become a huge part of many projects in car guy world. However the shop’s pre-65 philosophy was seriously compromised when they popped a non-existent-in-1964-Chevy 454 big block in it and tuned in an electronic fuel injection system with intake stacks that simulated the look of 1964. The computer technology behind the fuel injection was probably more sophisticated than the lunar landing module system that was still five years in the future in 1964. Maybe I am just a garden variety simpleton because I just could not connect the dots between their presumably old school shop and a host of new products like huge new age disc brakes, a very sophisticated coil-over suspension and six-speed transmission. 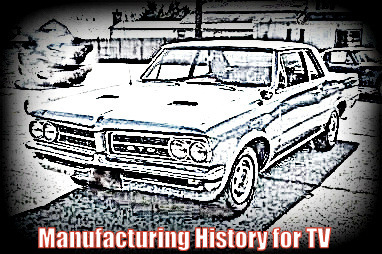 The wild gear-changer is a prime example of this big disconnection from logic; six-speed high performance trannies in 1964 for a passenger car would have been a reach-a big huge reach- for a hot rod shop in that time frame. Cars only have to look 1964 and older-everything else might be 21st century tech at its finest.